One of the biggest security problems to hit this year has to do with some design flaws with various computer processor chips from notable vendors. The breadth of the problem is pretty wide, but the details for consumers is a bit lacking. Much of the info out there is technical and yet there is still a lot we don’t know. A new freeware app called InSpectre sheds some light. For example, some of the fixes may impact performance. This means your PC could run slower, but to what extent. The answers depend on both your software and hardware. I found myself having difficulty answering this question so I was glad when Steve Gibson of GRC Research released a free utility for Windows users. It helps answer the most pressing questions. Who Is Gibson Research Corporation (GRC)? Part of the reason I was elated was I’m quite familiar with Steve and GRC. I listen to Steve’s weekly Security Now! podcast. I’m also an owner of SpinRite, which is a hard disk analysis and recovery program. I don’t necessarily understand everything that he says, but I trust him. His products have helped me numerous times. I would recommend that you only get the freeware utility from the GRC site at https://www.grc.com/inspectre.htm . Steve is continually updating the software as this is a fluid situation. Since I started writing this article, the software has gone through 2 revisions. In addition, his site points out certain known issues like false positives from certain anti-virus scanners. The GRC site page will always have the latest version. The version number also shows in the software under the bold blue InSpectre title. The software is for all versions of Windows and can query your processor’s specs at a detailed level. This would include Intel, AMD, and ARM chips. Since this is a Windows program, it may not work as well on Apple or Linux PCs. You would need to use something like Wine. 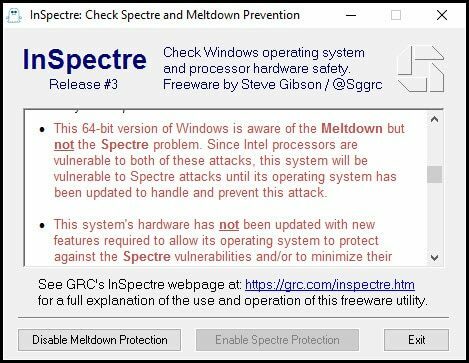 Is your computer vulnerable to Meltdown? Is your computer vulnerable to Spectre? Will the fixes impact performance? All these questions are answered in a straight-forward fashion. You’ll first see color-coded answers to the 3 questions and more details as you scroll down. In the screenshot above, you can quickly see this PC has issues. While the PC has a patch for Meltdown, it comes with a cost. The specific processor is too old and so there will be a performance impact. This makes sense as this PC is 7 years old. Ideally, I need to get a newer computer. A concern a lot of people have is performance. The tool has flagged performance as an issue for me and if I scroll down, I can see a more detailed explanation. Yes, the red text isn’t a good sign. it’s important to note that the performance indicator may be more than just your processor. For example, the PC being tested does NOT have the latest version of Windows 10 Fall Creator (1703) and that compounds my problem. In my case, there is also a button that gives me an option to Disable Meltdown Protection. If I wanted to do that, I could turn it off IF I’m an administrator on this PC. Obviously, this isn’t a decision I or the software can make for you. it’s a personal decision based on risk. Personally, I’m happy giving up the performance to be a bit safer. The reason speed has become an issue is some of the fixes are relying on 2 PCID instructions that the processor uses. The problem is only newer processors have the 2nd one of these instructions. Since my processor is old enough to have grandchildren, it’s missing the second instruction. So, even if I could get build 1703 to successfully install on this PC, I still have issues. These two bugs are likely to be with us for a while, possibly years. More vendors and solutions are coming out. I will most likely need a newer computer. Presently, the design flaw fixes aren’t in production chips. 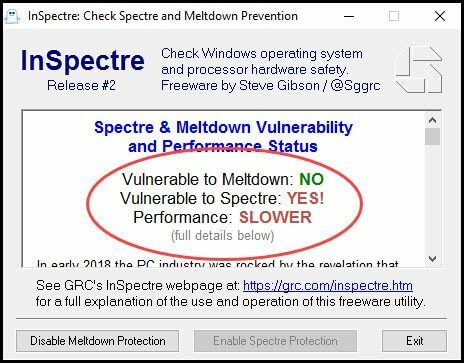 AMD is exempt from Meltdown, but still susceptible to Spectre. Who knows when we’ll get bug-free processors for both. But, if you’re buying a used computer, you may want to dig in and see if it’s vulnerable and can be fixed without too much of a performance hit. If you’re a Microsoft Windows user and curious about your computer, I did an article on how to check your computer specs.